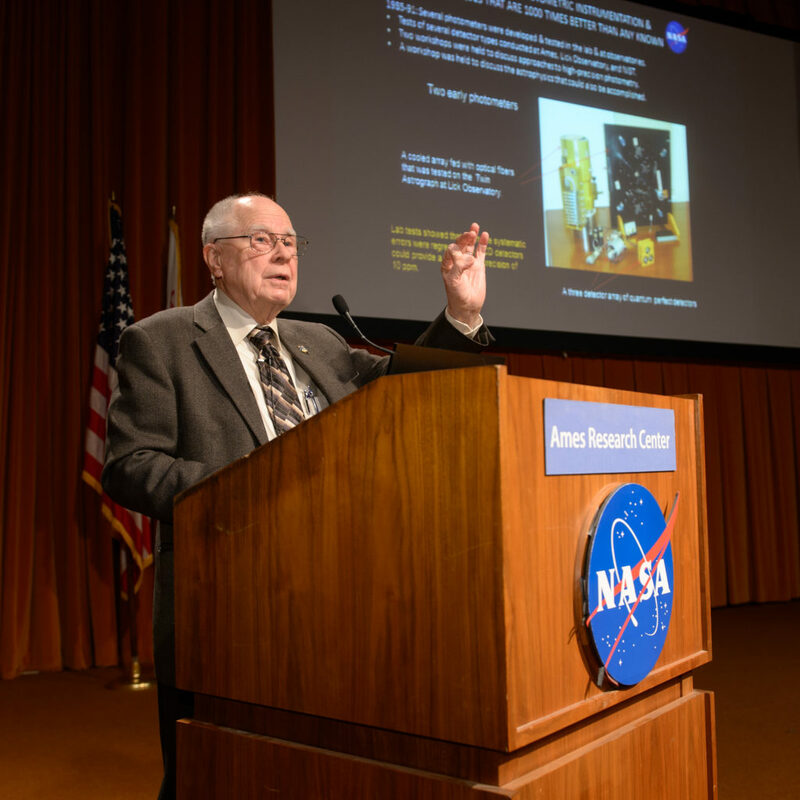 November 21, 2016 – William J. Borucki, principal investigator for NASA’s Kepler mission at the agency’s Ames Research Center in Silicon Valley, California, has been named a Fellow by the American Association for the Advancement of Science (AAAS). Borucki is recognized for distinguished contributions to the field of astrophysics, with his leadership of the Kepler Mission leading to the discovery of thousands of exoplanets. Kepler is the first NASA mission to find Earth-size planets in the habitable zone–the region in a planetary system where liquid water might pool on the surface of an orbiting planet. To-date, Kepler has identified more than 5,100 planet candidates, of which more than 2,500 have been verified as bona fide planets confirming that planets are everywhere. Beginning in 1992, with the first proposal for the Kepler mission to NASA Headquarters, Borucki led a determined team through a decade of tackling questions about technology that had not been flown in space yet. With the final concerns addressed, the mission once deemed impossible was approved for flight in 2000. “I am truly honored to be named a fellow by an organization that has a proud history of promoting advances in the sciences,” said Borucki. Borucki will be presented with an official certificate and a gold and blue (representing science and engineering, respectively) rosette pin at a ceremony Feb. 18, 2017 at the 2017 AAAS Annual Meeting in Boston, Mass. Previous honors Borucki has received include the 2016 Franklin Institute Bower Award and Prize; the 2015 Shaw Prize; the 2013 Samuel J. Heyman Service to America Medals presented by United States President Obama; and the 2013 Henry Draper Medal. Borucki earned a Master of Science degree in physics from the University of Wisconsin at Madison in 1962 and joined Ames as a space scientist that same year. The results of Borucki’s early work developing spectroscopic instrumentation to determine the plasma properties of hypervelocity shock waves was used in the design of the heat shields for the Apollo mission. In July 2015, Borucki retired from NASA after 52 years of service at the agency. Ames manages the Kepler and K2 missions for NASA’s Science Mission Directorate. JPL managed Kepler mission development. Ball Aerospace & Technologies Corporation operates the flight system with support from the Laboratory for Atmospheric and Space Physics at the University of Colorado in Boulder.